The well-established Jeep Grand Cherokee reemerges in 2015 just as sharp and tough as satisfied drivers have come to expect, and we've got a large assortment to choose from at Greenville Chrysler Dodge Jeep Ram, serving Commerce, and Rockwell, and all of Northeastern Texas with a wide and affordable inventory of all of new Jeeps. This year there are five trim levels: the Laredo, Altitude, Limited, Overland and Summit. The Laredo has plenty of top-level standards, including all power accessories, cruise control, keyless ignition, and a six-speaker stereo with 5" touchscreen. Auxiliary inputs for your iPod and other technologies, as well as a CD player and Bluetooth are also standard. The Altitude adds a power lift gate, heated suede seats and a 110-volt power outlet. The Limited includes a special chrome trim, a rearview camera and parking sensors, as well as an upgraded stereo system with nine speakers. Options for the Limited edition also include a Luxury package and two different off road packages. Both Overland and Limited trim levels have the Advance Tech package available, with blind spot and cross-traffic sensors, for high tech safety. The Overland includes a tow package for ready-to-go versatility, an impressive panoramic sunroof, and an 8" touchscreen infotainment system with navigation. The Summit is the highest point in this line, and includes wood accents and active noise cancelling, for a luxurious ride, as well as the Advance Tech options previously mentioned, as well as a whopping 19-speaker sound system by Harmon Kardon! Power train choices abound from a V6 offering 290 horsepower, to a 5.7-liter Hemi V8 with 360 ponies, as well as a turbo diesel V6 option with 240 horsepower. The diesel is the leader in torque, but an eight-speed automatic gearbox is included for all three engines, and there are several four wheel drive options. As always, you're sure to find a Jeep Grand Cherokee that suits your needs. 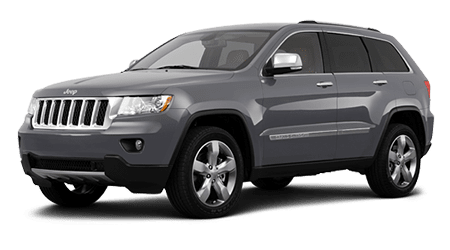 For a close encounter with this beautiful SUV, come into Greenville, Texas's premiere Jeep dealership, Greenville Chrysler Dodge Jeep Ram today for a test drive!